In all honesty, it has been many years since I last felt excited about a DIO album, fact rooted more in mainman and namesake's inability to maintain the standard achieved on his first two solo albums than a general disinterest in the singer's sound. Ronnie's latest offering is no different in that regard, with much of the material offered herein coming across like a rehash of the singer's past efforts than an attempt at injecting new elements into the proceedings. This in itself wouldn't be such a bad thing if the tunes contained on the CD were of a high enough caliber to stand alongside DIO's classic efforts, but sadly that is not the case. Instead, Ronnie seems unable to move forward into the 21st century by elevating the quality of his songwriting to a standard consistent with his earlier output, focusing exclusively on rehashing a once-successful formula that has long since lost its effectiveness. To DIO's credit, he has given up trying to modernize his sound by adopting a darker approach that resulted in a career low point in the shape of 1996's Angry Machines effort. However, in his attempts at sticking to what he does best, he has failed to make up for the fact by penning truly memorable tunes, with much of the material contained here sounding like pale imitations of DIO's previous offerings. On a couple of occasions, such as in "Throw Away The Children" and "Scream" (my personal favorite), he is marginally successful, aided in no small part by the latter song's driving groove and undeniably catchy chorus, which is among the best Ronnie has penned in years. Too often, however, as in the first single/video, "Push", the hook is relatively substandard and takes a backseat to the admittedly first-rate guitar work courtesy of former LION/HURRICANE man Doug Aldrich, whose contributions are undeniably among the LP's highlights. 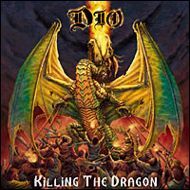 A stronger effort than some of DIO's more recent offerings, Killing The Dragon is an album made for die-hard DIO fans who lap up everything that the man produces regardless of its quality. The rest of us, however, will want to spend our money elsewhere.